On Tuesday, May 31, TCA visited the Filipino American Multi-Cultural Center in Oxon Hill, MD for an awards ceremony hosted by the National Filipino Cultural Foundation Inc. (NPCF) honoring recipients of TCA’s 2014 donation for Typhoon Haiyan relief efforts. 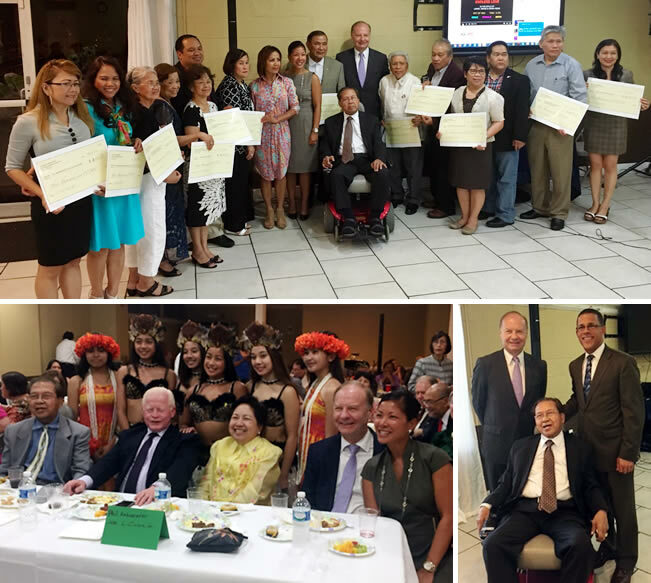 TCA President G. Lincoln McCurdy and Ms. Kriselda Valderrama, a member of the Maryland House of Delegates, distributed the grants to Filipino American organizations based in the U.S. that have Typhoon Haiyan relief projects in the Philippines. TCA also visited the cultural center on June 7 for a farewell reception honoring Philippine Ambassador to the United States Jose Lampe Cuisia, Jr. The events illustrated TCA’s growing relationship with the Filipino American community and served to strengthen ties between the Turkish American and Filipino American communities. In attendance at the two events were former Maryland Lt. Governor Anthony Brown; Philippine Ambassador to the United States Jose Lampe Cuisia, Jr.; Thomas V. “Mike” Miller, President of the Maryland Senate; Hon. Kriselda Valderrama; and David Valderrama, a former member of the Maryland House of Delegates and Chairman Emeritus of the NPFC.